Dewesoft X offers high performance storing engine with more than 500 MB/sec write speeds with advanced triggering capabilities, remote network storing with precise synchronization of acquired data. Dewesoft X's powerful storing engine can stream and store the data to hard drive with more than > 500 MB/second sustained stream rates. Even with such large amount of data, Dewesoft X can open gigabytes of stored data in a matter of seconds. The innovative design of file structure allows us to write the channel setup, display setup, all the events, fast analog data and slow asynchronous data from different sources into a single file and reload this file in a matter of seconds. 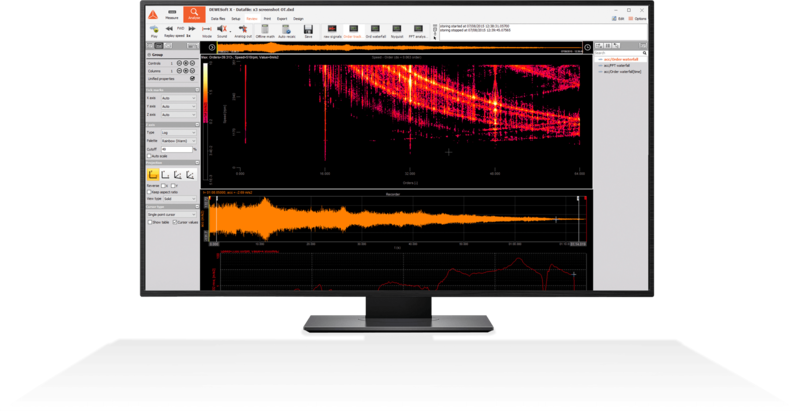 For long-term measurements, Dewesoft X offers a multi-file storing functionality. It will automatically assign a new file name when a certain size, time or any other criteria is reached. File names can be either consecutive (such as 0001, 0002, 0003) or by the date and time variables. Simple edge: rising or falling slope. Filtered edge: edge plus rearm level in either slope. Window: two levels - entering or leaving logic. Pulsewidth: longer or shorter than duration logic. Window and Pulsewidth: completely selectable as above. Slope: rising or falling slope with steepness selection. Data is only stored when one or more trigger conditions are met. The software also allows to set pre- and post-trigger time to store data before and after the trigger condition is met. Since there is no data stored between trigger conditions the amount of stored data is minimized. When analysing the stored data we can easily move between trigger windows and analyse the events. 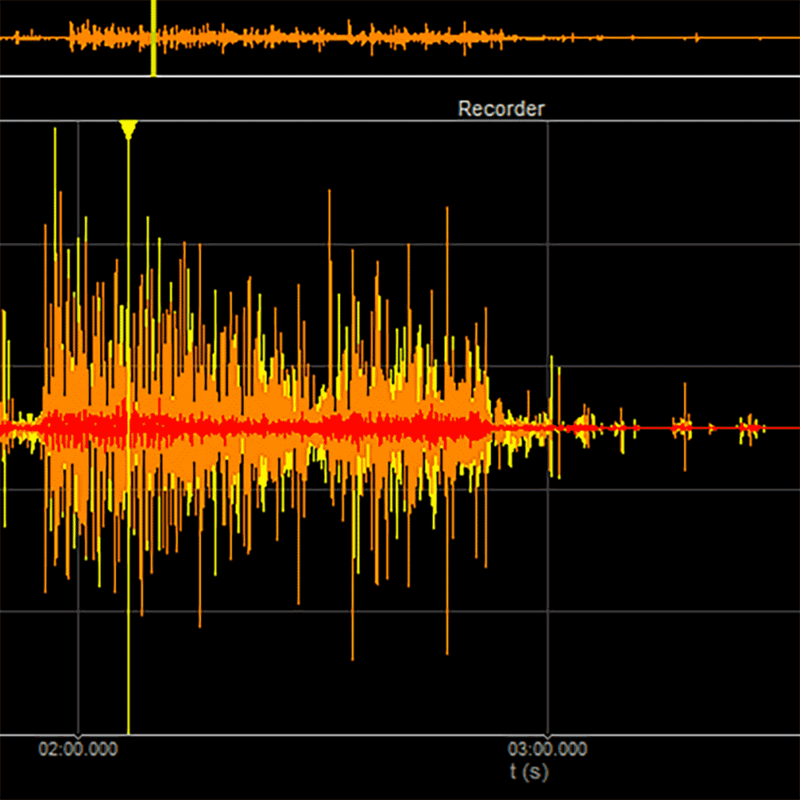 The recorder screen offers cursors for absolute values, time or frequency. Pre and post data analysis of triggered events is possible. Always fast: data will always be stored at full sampling speed, as defined by the dynamic acquisition rate. Always slow: data will be always stored at reduced sampling speed as defined by the static/reduced rate. Fast on the trigger: data will be stored at full sampling speed defined by the dynamic acquisition rate once the trigger condition occurs. Fast on trigger slow otherwise: data will be stored at full sampling speed defined by the dynamic acquisition rate at trigger points, and with the reduced rate when there is no trigger. 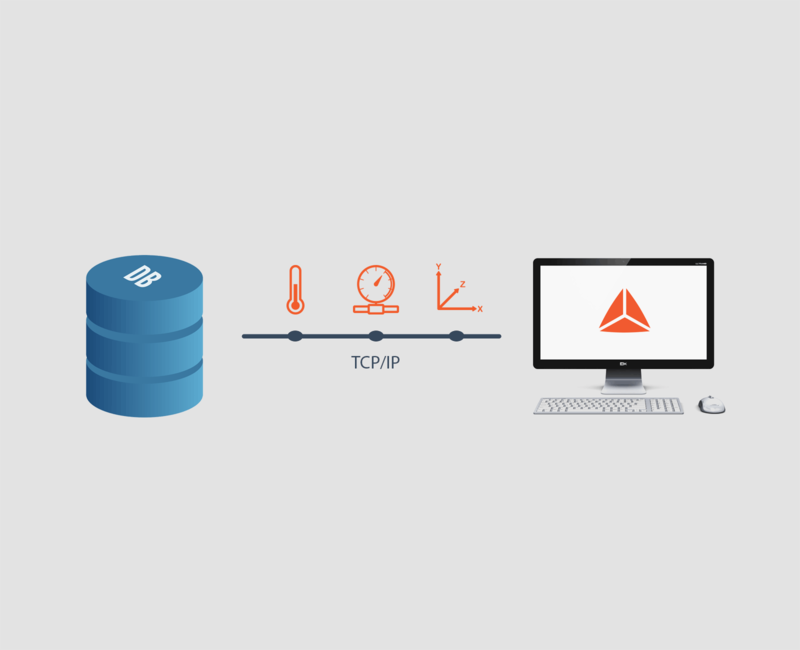 With the Dewesoft NET option, users can easily control and store data to or from a remote location, as long as your locations are connected with a standard TCP/IP connection. Dewesoft NET option serves as a hub for Distributed Data Acquisition Systems. Several DAQ systems can be combined and synchronized together. 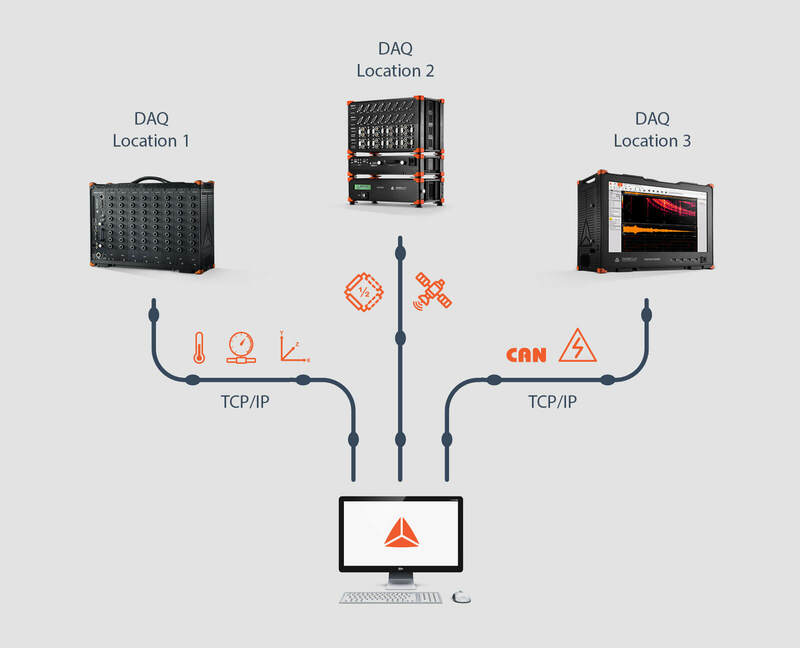 DAQ systems can be located together or scattered across an entire continent. Their data can be stored remotely in a single, centralized computer. IRIG and GPS time will take care that data will stay in sync. In the full remote control mode, the client computer acts as the master of the measurement system. When the client changes into the setup mode, the measurement system also changes into the setup mode. This mode works with multiple measurement systems and a single client. This scenario is useful when you need to distribute your measurements to multiple locations or when the channel count or acquisition rates are too high to be handled by a single measurement unit. The measurement system has to be clock-synchronized either with hardware clock (one unit serves as a clock master, all other are slaves) or with an external clock source which is either IRIG or GPS. All measurement systems have to run with the same sampling rate. The client is always the master. It starts and stops the acquisition of all measurement units in the network. At any time the client has the access to view mode on one of the selected measurement units. Additional view clients are possible, but they can only view a single measurement unit. 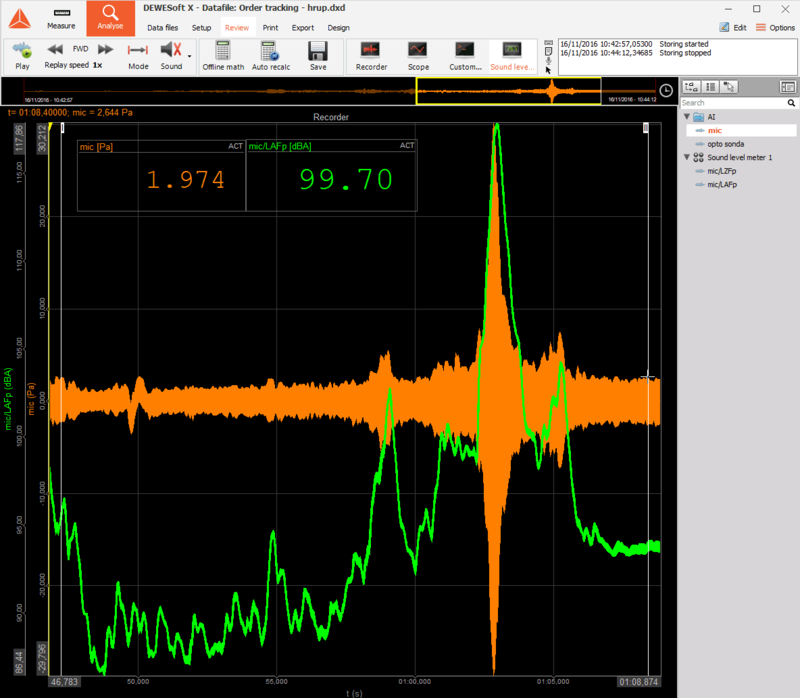 This mode works with a single measurement system and multiple clients. One of the clients serves as the master client which can have full control over the measurement system. All other clients are view-only clients. The master client is able to change the measurement system setup, storing strategy, start and stop acquisition, etc. The other view clients are only allowed to use a few channels from the measurement unit (up to the limit od the bandwidth) to view and store the data on their local hard drives. For applications which require long-term storage, especially industrial applications, Dewesoft X offers Online Data Export (ODE) add-on for storing data directly into the relational database for statistical analysis or real-time analysis of production status. Currently, only MySQL and Microsoft SQL Server database engines are supported. The database can be either installed locally or on a remote computer. Data can be stored directly to the database during the acquisition itself or to a CSV file, which can be later imported into the database. 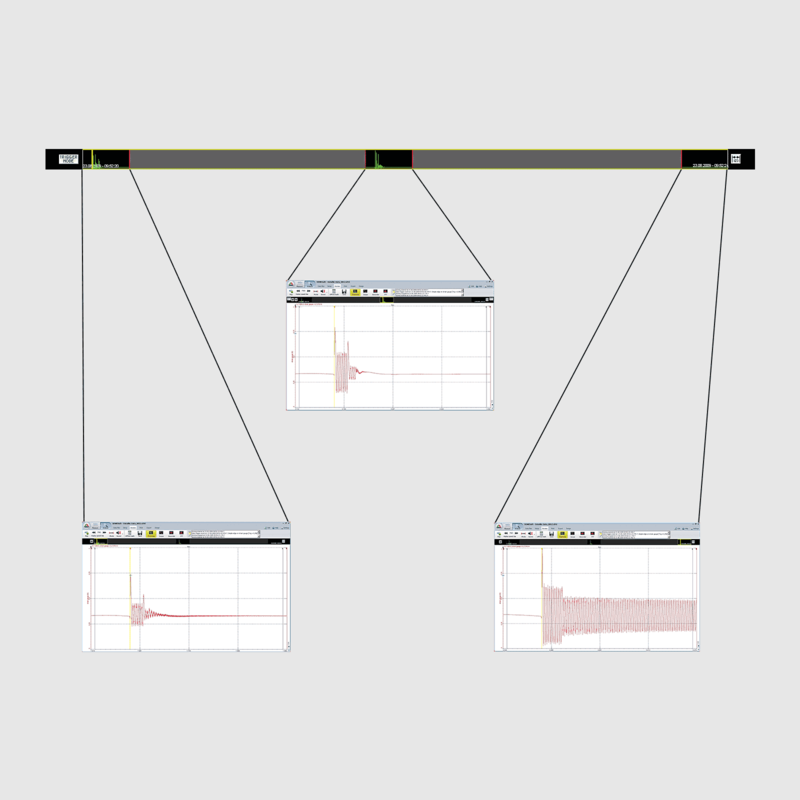 The ODE add-on is suitable for real-time monitoring over long periods of time. E.g. store slow analog or statistical data continuously into your database to monitor the conditions of the measuring object. Dewesoft X will always store raw data from hardware interface channels and keep it untouched. Any math applied to these channels will result in additional math channels which will not alter the original raw data in any way. This allows existing and new math to be changed and applied later in analyze/offline mode easily. No more worries if you forgot to apply or your math was wrong during measurement. Now you always have the capability to change it at any time.